In this era, hand-held mobile devices are becoming more and more sophisticated in terms of features and usage. Majority of computer users, despite the fact that they spend countless hours using their PC, still find the time to use their mobile phones to browse the Web. There also comes a point where they use their mobile phones as substitute for their laptops and computers because it is more portable. It is a fact that newly devised mobile phones can compete head to head with other computer devices in terms of performance and reliability. WordPress mobile theme allows bloggers to access their site anytime anywhere using their mobile phones. Having an Internet-ready mobile phone that can view any type of website containing videos, photos and other multi-media elements is quintessential in the 21st century. There are different types of blogs created depending on the blogger’s interest. If you are a news blogger, then Tap News is the best theme for you to use. This theme is designed specifically for IOS, Android and Blackberry devices only. It has very cool features that let you access your blog as if you are using a computer system. One advantage of this theme is that it allows you to change your AJAX and Java effects whenever you like. This flexibility and freedom is perfect for your many needs. Guessing what kind of mobile device iWorld works with does not take rocket scientist genius level. 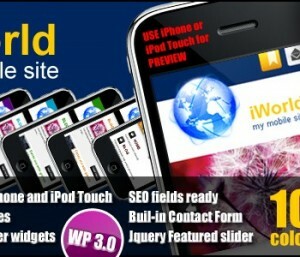 As the name suggests, this mobile theme is designed solely for Apple users. iWorld has jQuery and has a built in ten color scheme for a variety of choices. Using this theme on your Apple device allows you to fully maximize the theme’s full features. It runs perfectly and would certainly give you the blogging experience you’ve been searching for. Falling in love with this one of a kind theme is certain. Breathe is one of the many themes that allows you to fully utilize the many aspects of blogging in the comfort of your mobile phone. This theme is made to be compatible with almost any kind of blog you are working on, making it a very versatile application. 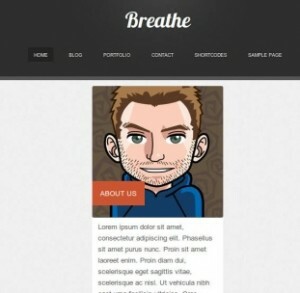 Breathe is also the theme to be used for your portfolios since it has a fluid layout. If you’re a blogger who loves to put advertisements on your web page, then On Demand Mobile theme will suit your perfectly. This theme is fully functional and caters to all your add posting needs. If you are running a blog where you endorse products you will need a theme that has the necessary features to manage it properly. 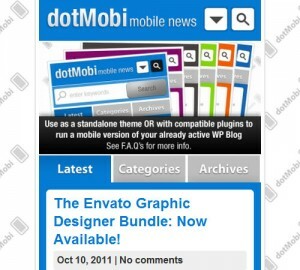 This theme is also capable of linking Google ads and AdMob ads with its insert feature. Blogs can also be about social networking. For the best experience in accessing your blog that involves plenty of social networking then DotMobi is the right theme for you. It is a fully functional stand alone theme that can be used to support others themes that you are already using in your blog. It can also stand just by itself. No modifications are needed for this theme since all the basic functions and plug-ins are already installed. If you are a Twitter fanatic then you will love the Twitter feed function of this theme which you can manually turn on and off. 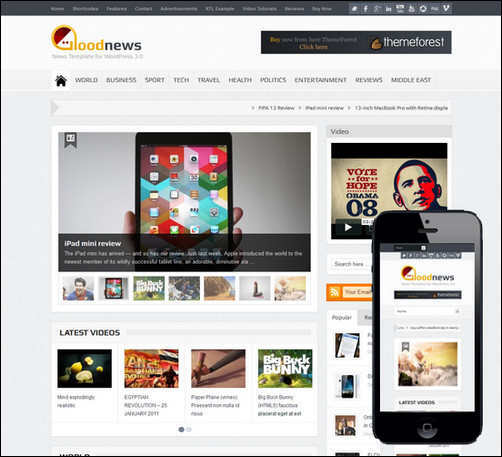 This WordPress theme is one of the most used by designers and developers. The user interface is very simple despite the fact that the purpose of making this theme is to be elegant. What’s great with this theme is that it behaves more like an application rather than a rigid theme. It’s very flexible in terms of performance and usage, and that is why bloggers love to use this. This theme was made to be very responsive so that it can be used on almost kind and type of mobile phone. This theme is very versatile in terms of compatibility. Creators of this theme made sure that it would run on any kind of mobile phone. This kind of theme also uses the well known jQuery scripting which makes mobile blogging so much easier. 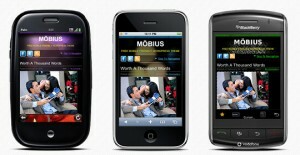 The features of Mobius are sure to cater to all your needs. A bonus of three varying skins are provided in the package. NewsPress was made to cater exclusively to Apple enthusiasts. 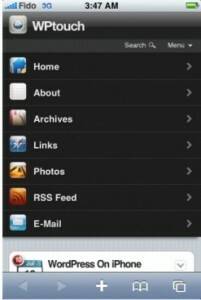 The theme is equipped with features that would work well on a device like the iPhone. It is very user friendly and the design was molded to complement the features of Apple products. This theme is equipped with RSS support as well as push email functions for easy usage and navigation. For a theme that has so many functions (such as jQuery , AJAX and various effects) the size of this theme is comparatively small. If your blog features a lot of videos then Vidley is the perfect theme for you. This theme is perfect for bloggers who would want to always be updated with the latest trends. When this theme is used on a smart phone, the videos on your blog can be viewed with great clarity. It is as if you are watching the same video on a personal computer. This theme also allows you to make customized icons and logos. A reminder, this function however is only possible with Apple home screens. 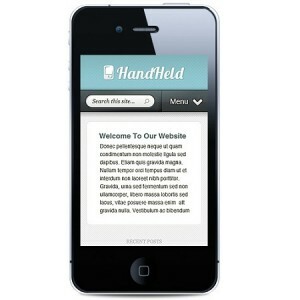 HandHeld is another great theme that offers high satisfaction to any user. 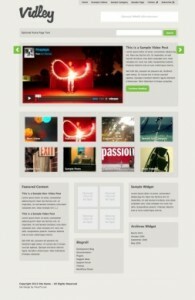 This theme mostly applies to designer blogs as well as blogs that feature a lot of photographs. This theme is also able to read PSD files, which makes it really perfect for viewing images. Another fascinating feature of this theme is that it can be simultaneously used with a theme that you are already using. 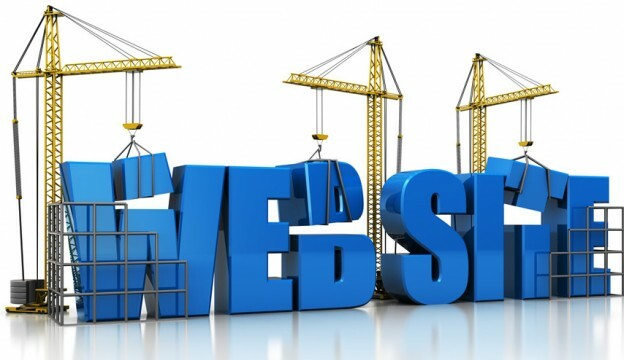 Posting on this theme has never been easier since it is coded with HTML5 and AJAX functions as well.